Closely resembles steel strapping's physical characteristics. 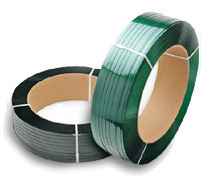 Polyester strapping absorbs shock and retains tension around shipments. Split resistant and less notch sensitive than other strapping. Elongation is only 1-3% ensuring tighter straps and more stable loads. Virtually unaffected by weather or ultraviolet rays. Polyester strapping is significantly lower in cost than steel, safer to use and easier to dispose of. New: embossed polyester strapping - Embossed strapping gives extra friction and increased joint efficiency plus reduces slipping out of closures.